#accurate. This accurately represents my place at the moment: suspended, being indecisive, and not being quite sure how to surrender. Surrender is still on my radar. 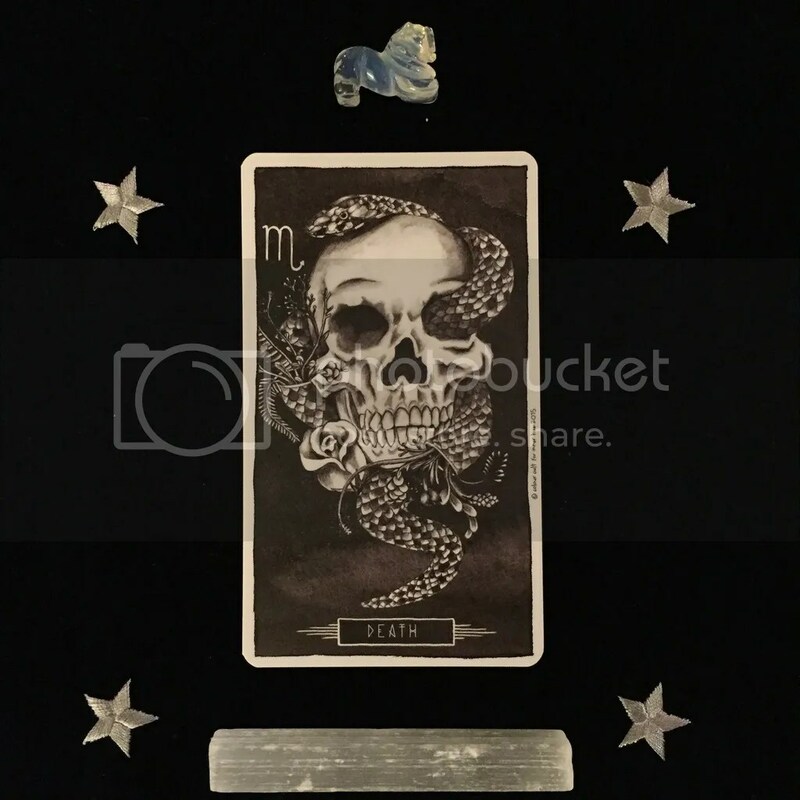 Ever since my encounter with a Medium, surrender has been on my to-do list but how does one do it? I’m plagued with “Am I doing it right?” Who even knows! The Intuitive Reader I saw on Saturday told me to make a decision and just dive in and go for it! And wouldn’t you know it, Alie posted this video on her IG about inaction being a choice. 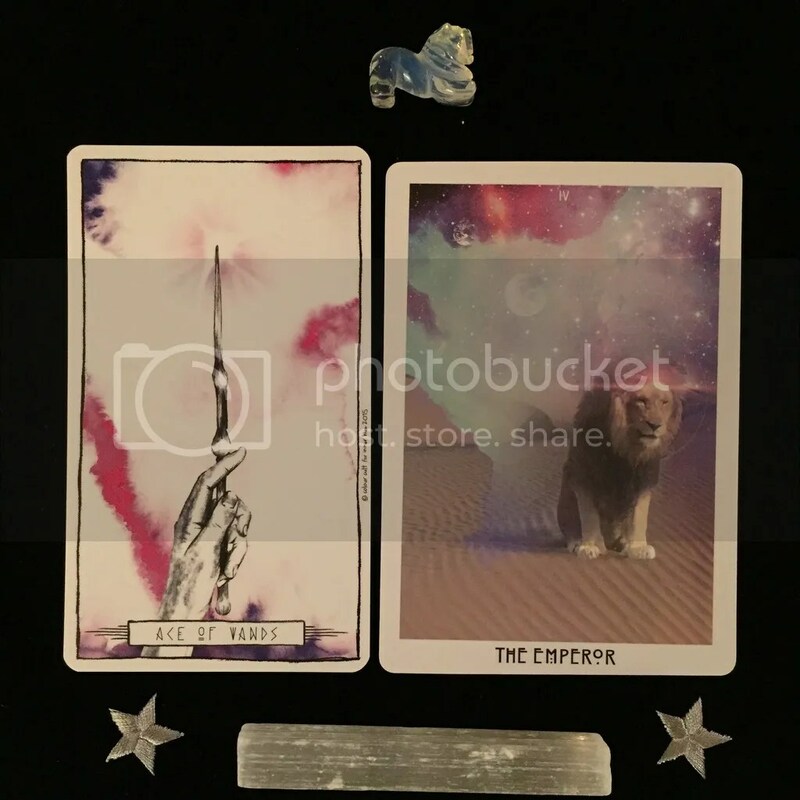 You know I like to flaunt my “textbook Libra” ways and right now, I’m suspended in fear, doubt, worry, and all things yucky, so I feel like if I make a decision, what if it’s the wrong one? There’s only one way to find out, I guess. Major neighbours! I was surprised to see these two next to each other since this is a well-shuffled deck but there is a strong message here. Death is all about transformation, the death of one thing and the beginning of another. Guess who has a *tiny* fear or change? This gal right here! Yes, I hear you, card. It’s time to release my fears around transformation and change. Make the decision, right? Whoa. When I pulled the Energy-Healing Work card from the Archangel Michael Oracle, I was like, “Weren’t you just looking at getting some Reiki done and wanting to learn the basics yourself?” Then, the next morning, I received part 1 of 2 of Lisa’s Energy Work exercises in her newsletter. What the what! 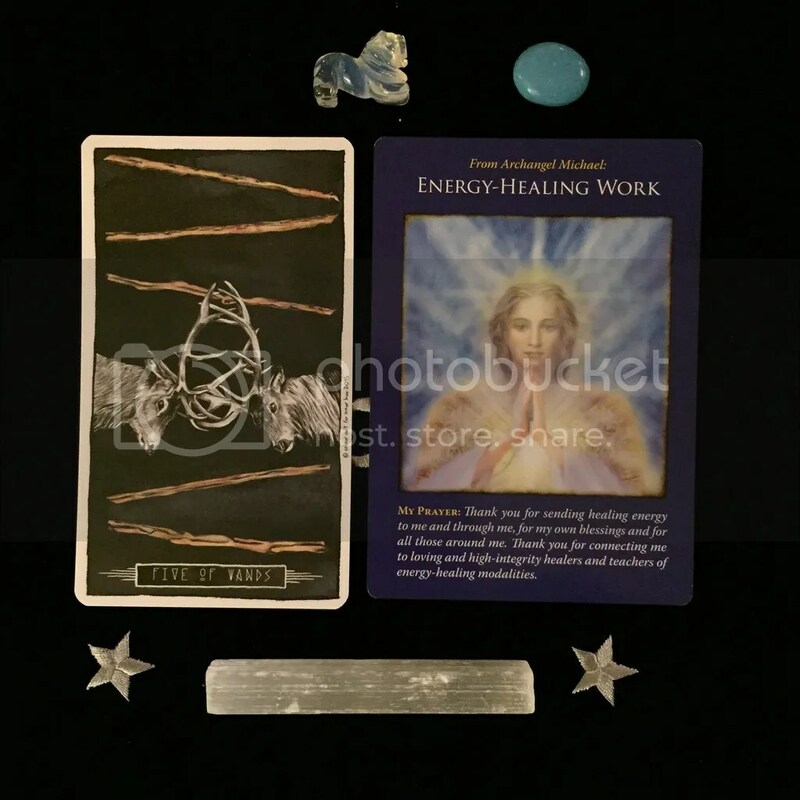 I think there’s a strong message here with the Five of Wands paired with Energy-Healing Work. 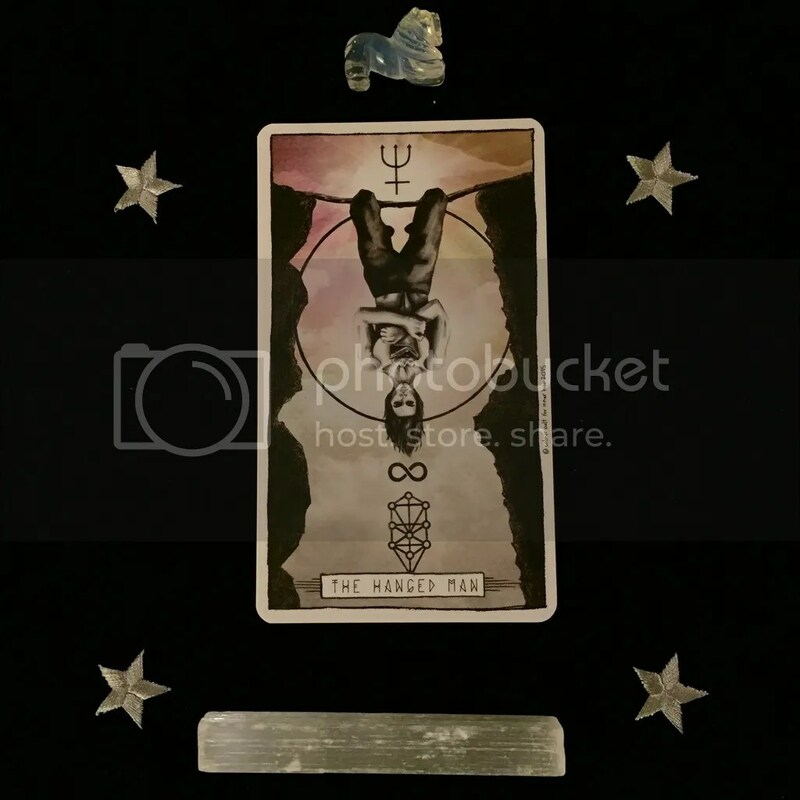 The Five of Wands is all about conflict, butting heads, not seeing eye-to-eye. That pretty much sums up my situation at work. No matter how much I try to work together with certain people on certain projects, we keep butting heads and I’m so done with it. That’s not a great environment for me, or anyone. I took the Energy-Healing Work card to represent what needs to be done in order to clear that from my Aura and shake off those bad vibes. This card is about momentum to me, but a particular kind of momentum. 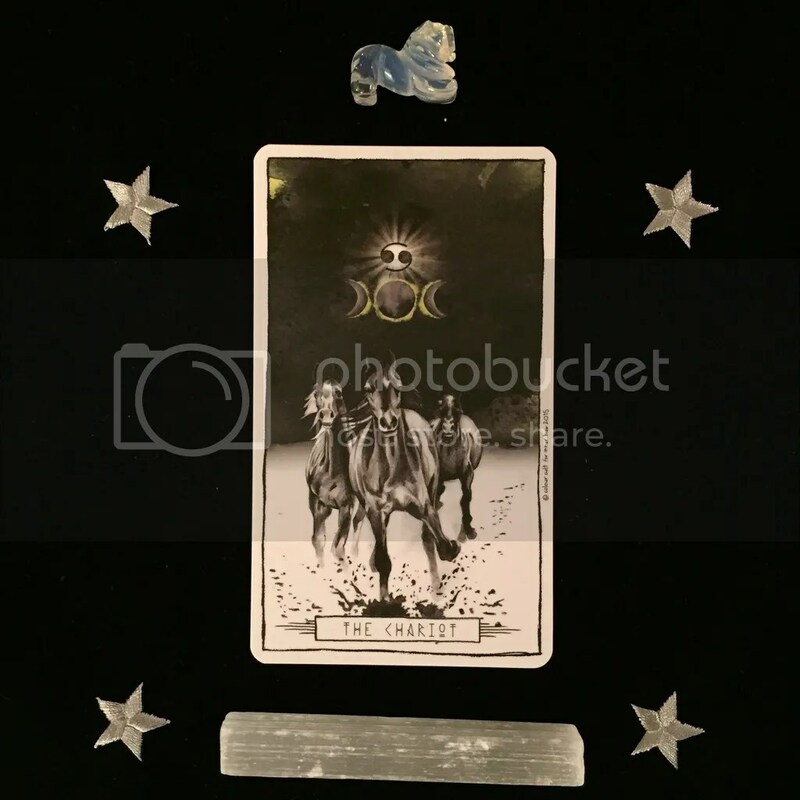 The Cancer part of this card makes it emotional (for me, at least) and the horses appear to be running toward the same thing. That aspect represents being in control, exercising will-power, which I kinda don’t sometimes, but I’m getting better! If April’s card taught me anything, it’s that I have started to find my voice and stand up for myself more. I’m pretty sure me getting sick at the beginning of May was also part of that, like, all the bad stuff coming up to the surface to be washed away in a Sacred Bath. One foot in front of the other is always a good start. Here’s where the fun continues! 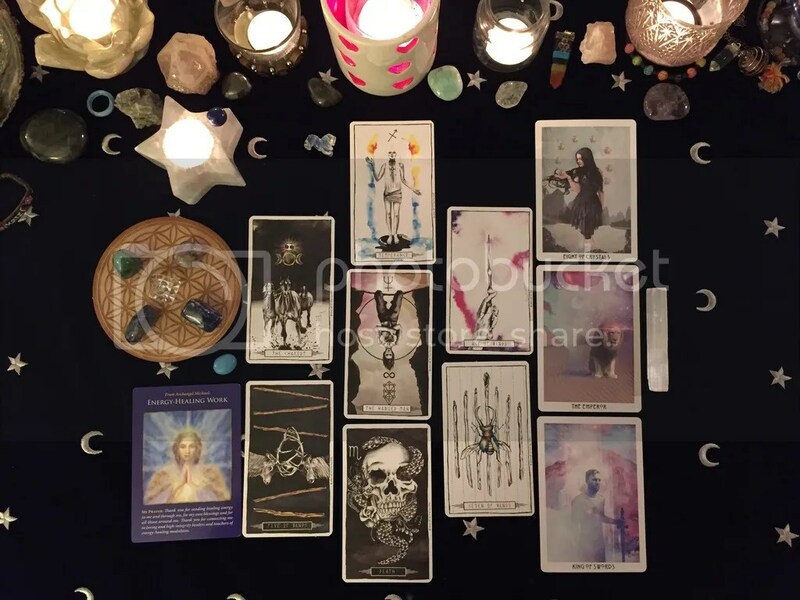 My Starchild wanted to join in on the #tarotmotivation with my Lumina deck. Temperance? Oh yes, balance, meaning, patience, moderation… Eight of Crystals? Definitely skill mastery, and not just in the Reiki variety or Tarot skill level-up sense, this is also representative of my skill set for the ol’ day job. 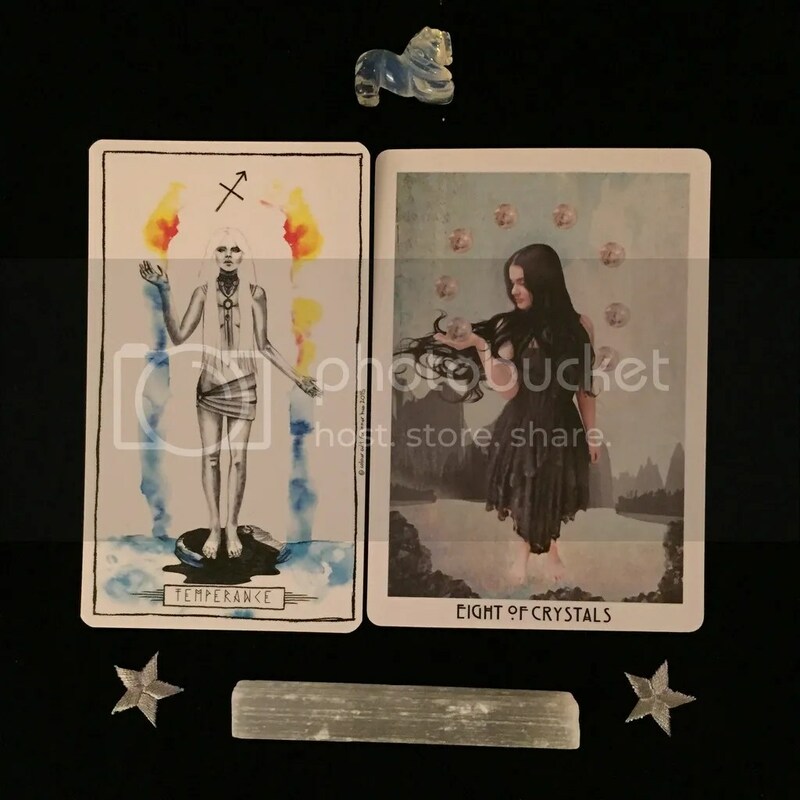 The patience that the Eight of Crystals / Pentacles exhibits is quite complimentary to the patience of Temperance, I think. The Intuitive Reader I saw on Saturday was very encouraging in telling me that my two worlds of Film & Television Production and Tarot & Intuitive Skills will combine into one beautiful thing. That definitely sounds like what my heart and soul really wants and this is so sweet for that! Well, I guess my dream of the conflict being over is that, just a dream. But at least I’ll be taking a stand and defending what I believe in and what I’m doing. With the cool head of the King of Swords on my side here, I think it’s pretty clear that what I’ll be defending won’t be for nothing. The determination of each of these cards is reassuring. 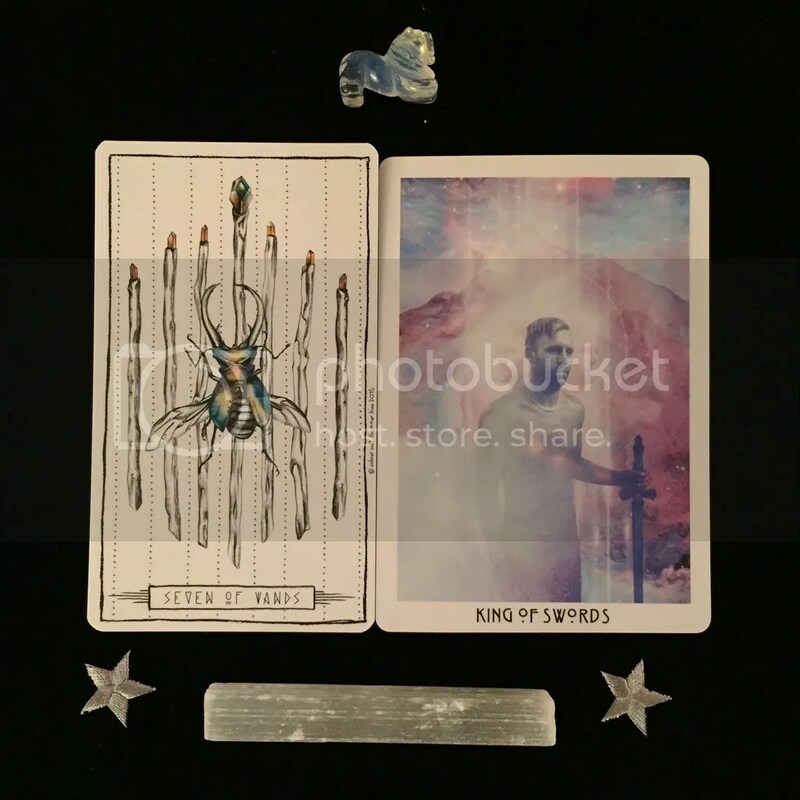 The Seven of Wands is about standing up for yourself and staying on top, while the King of Swords is a strong leader who can see the truth, without letting emotions cloud the judgement. The Air (Swords) fans the Fire (Wands) and that is a very powerful combination, indeed! How was your Full Moon weekend? Did La Luna reveal messages for you? I’d love to hear them!